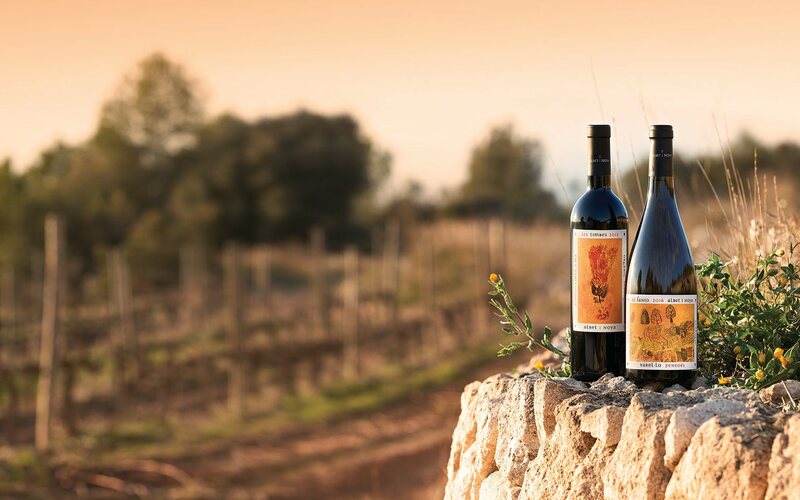 From our highest, oldest (eighty years old) and most attractive vineyard, we produce El Fanio, a complex, expressive 100% Xarel·lo aged in cement eggs and acacia barrels. A wine that breathes the landscape of garrigue, thyme, rosemary and pine resin that surrounds the vineyard. The deep roots struggling through the stony soils provide the maximum expression of this unique terroir. The surprisingly creamy elegance of this markedly floral Xarel·lo blends with notes of fresh fruit orange blossom and fennel. In the mouth it is full bodied with fresh acidity and hints of quince jelly with a final characteristic note of Xarel·lo. An oddball, an experiment, a dare. Caladoc, Marselan and Arinarnoa are three largely unknown varieties, conceived in the search for the perfect grape. Together they produce this rounded, well balanced and profoundly spicey wine. These French varieties have found niches in the Ordal mountains where they express their very best potential. A garnet red wine with pleasant aromas of ripe fruit, spices, creamy oak, toasted notes and a hint of cocoa that is typical of Marsalan. In the mouth it is tasty, full-bodied with the ideal balance of acidity to be enjoyed it on its own, or with grilled meats.